Imagine this: You’re a parent with five kids, ranging from 16 years to 9 months old, and you’ve gone back to school full-time. Your spouse is attending the same college, and together, you’re trying to make sure your family is taken care of – all while completing an internship and maintaining good grades. While juggling seven different schedules and a hundred daily responsibilities, you’re hit with a large, unexpected sewage bill and a balance from daycare at the same time. You’re stuck with a decision you don’t want to make: Do you pull your son from daycare, or do you and your spouse stop classes – even though completing your education will improve your future work lives? Her determination paid off: She and her husband made the President’s and Dean’s Lists, she completed her internship at the Salvation Army, and she received a job offer from her church post-graduation. The “very hard, long road” for Erin and her family eased up thanks to Dreamkeepers. “Had they not helped me, I wouldn’t have been able to finish school,” she said. For Janay Corbitt, a student at Clark State Community College, tragedy struck twice within a span of two months. In 2014, her sister passed away, as did her daughters’ father. Janay suddenly found herself sole caretaker for her young daughters, as well as her sister’s 15-year-old son. As a full-time student, her troubles paying for school cropped up around the same time. On top of family adversity, Janay’s car broke down. “I had no way to get to school,” she said. Janay heard about the Dreamkeepers program through a teacher who took a liking to her, and who encouraged her to apply for emergency aid through the program. Janay applied online and received a reply back within a couple of days. The grant aid for a bill and rent, Janay said, helped her tremendously. “I wouldn’t have continued my education without the program, being so busy and trying to meet needs at home,” she said. Despite the stress in balancing home and school life, Janay remained determined to pursue her social work degree. Her passion for helping others with drug and alcohol addictions led to starting her own organization, Family First Adult Recovery Center, where she serves as CEO. 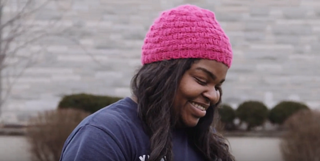 The educational experiences at Clark State – including an internship with a woman who now helps oversee her work at Family First – boosted Janay’s motivation to finish her degree. “This is so important to me, because I’ll be the first in my family to finish college,” she said. Janay’s future – and future she’s shaping for her daughters and nephew – is bright. She continues to lay the groundwork for Family First, with the State of Ohio recently certifying the organization to provide services. And, just last winter, Janay was accepted to Wright State University, where she’ll complete her bachelor’s degree. After that, she plans to receive her master’s degree in social work. If you’re interested in learning more about Dreamkeepers or starting a program on your campus, visit ScholarshipAmerica.org, or click here to take a College Readiness Assessment.